A Thing for Roses: Happy Halloween! Here's a picture from a few years ago. Cute, right? For some reason I can't find one more recent. 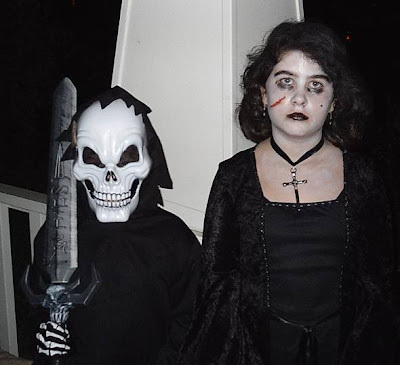 This will be the first year my daughter (now in high school) is not trick or treating. My son (still in middle school) will be going out tonight dressed as a skull head rocker. Fun, right? My daughter and I will be going to the high school football game where we will meet up with her boyfriend. Should be interesting as it is now officially fall in Oregon which means rain. Lots of it. Checked the extended forecast this morning and it looked pretty wet all weekend into next week. On another note, I promised to show you what I got at the Portland Expo last Friday. First off, I showed up at the Expo Center parking lot at 6am where I set up to sell some stuff I just threw in my car last minute. This stuff was pretty much leftovers from when I cleaned out my booth. Good stuff, just tired of looking at it. I managed to sell a few things which meant I had money to shop when the doors opened at 10am. Here is a picture of my well organized stuff in the parking lot. I promised I would help Isabel get her booth set up which didn't take too long and then I was off for a few hours of shopping. My first find was these pillows. Kind of scungy looking, but they look much better now that I gave them a good soak. 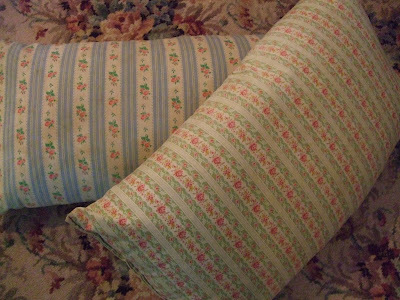 I love ticking feather pillows, but down are my favorite. I may sell these, haven't decided yet. Next I got a pretty vintage crinoline. This I will save for Farm Chicks. 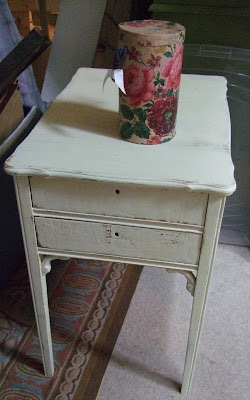 I then found this adorable little side table with two drawers for a great price. Another item I would love to keep, but I would have to get rid of something else. The little wallpaper box on top came from Sue. 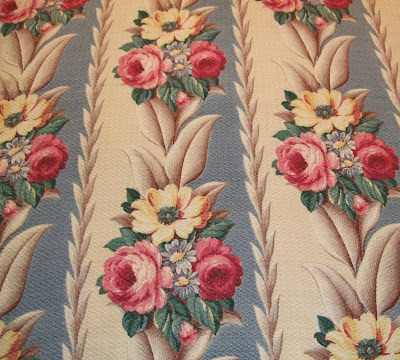 I also got these awesome Glen Court Barkcloth drapes from Sue. I love them. They too received a good soak and came out beautifully. I have a large panel just like these, but with a blue background that I have been debating on whether to sell or not. It is the last of a total of 6 panels. I sold the first 5 on ebay awhile back and I thought I would keep the last one to cut up for pillows and such. Just haven't had the heart to do it though. The panels I got from Sue. My last purchase at Expo was this roll of lovely wallpaper. 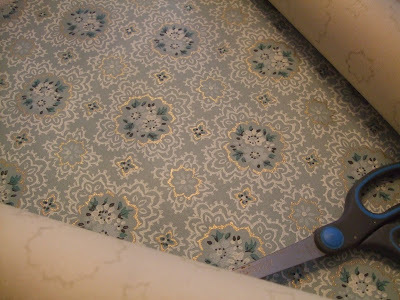 I love the aqua color and vintage wallpaper in pretty prints is always something I buy if I can find it at a good price which this one was. From the same dealer I got another vintage silver ladies watch (not shown) to add to my already large collection. While at Expo, my good buddy, Mitzi called. 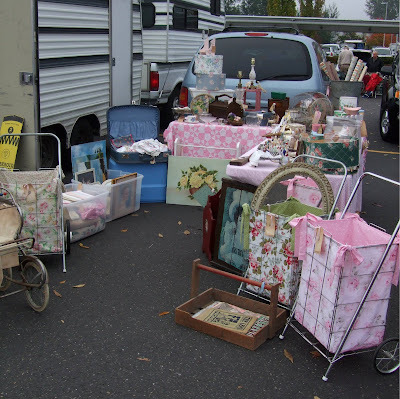 She said, "I'm at a sale in Newberg and you have to come. They have a ton of vintage crinolines." Now, just the week prior I had told Mitzi to be on the look out for crinolines for me. I had been having a really hard time finding them. I thought I would find them at thrift stores with all the Halloween costumes, but no. Not a one. Well, I drove straight to the sale after I left Expo and was so pleased to see they were still open. The ladies there said, "you must be the can-can lady," which I thought was kind of strange, but oh well. They had a ton of cool old crinolines, but I just picked out the very best ones. They gave me a little bit of a deal on them and then I found another really cute one in need of repair that I had to add to the pile. 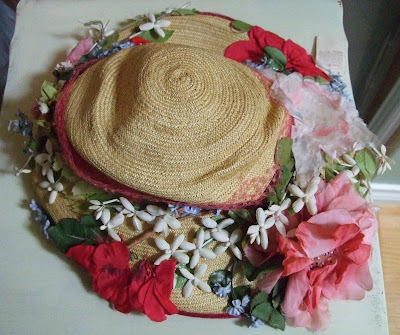 I also found a cute vintage hat with awesome flowers and a cool old shopping cart (or "granny cart" as Mitzi would say). Apparently these gals used to have a costume store many years ago. They put all of their inventory in a storage unit where it has sat for a long time. They now live in Kansas, but came out to clear out their unit. It was kind of hard to capture how cute these crinolines are, but here are a couple piles of them. And the Minnie Pearl hat. Well, I hope you enjoyed my finds from last weekend. I want to thank those that left comments on my last post about my picture in Artful Blogging. I really appreciate all the blog love you sent my way. Next up, The All Saints Bazaar on Saturday, November 8th. I'll get the address up on my next post and show a little preview of what I will be taking. Better get busy! Hey - pretty cool to make those parking lot sales to have money to shop with! and I love everything you got! Wow!! So much eye candy! LOVE that vintage barkcloth. It's GORGEOUS! Fabulous, as usual!!! You are one lucky girl with all those yummy finds! I look for those crinolines all the time while thrifting down here in Eugene, and don't have much luck finding them. Good stash you found! Love the barkcloth panels too! Oh my what a small blog world. I'm your neighbor across the Colombia River in Vancouver, WA! As I was reading places started sounding familiar. Sooo, I ventured to your profile to solve the puzzle. I surely enjoyed all the vintage pretties. Wow, good stuff! 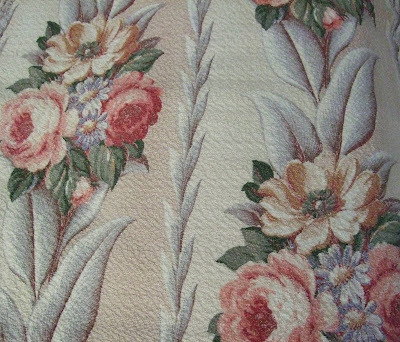 I am always on the hunt for old wallpaper, and never seem to find it at sales. Congratulations on Artful Blogger! Awesome, and I can't wait to go buy it! Love the Minnie Pearl hat!